The Arizona Landlord's Deskbook. 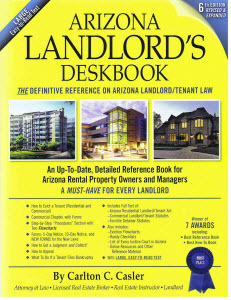 THE definitive reference on Arizona landlord/tenant law. Includes forms, step-by-steps instructions on how to evict a tenant, flowcharts, checklists and much more. Available in paperback, eBook (on CD-ROM or download), and Forms CD (all forms from the book with fields enabled for printing and/or saving). The Tenant's Survival Guide. An indispensible guide for Arizona tenants.